Learn Tai Chi as a way to relax your mind and energize your body. This open level class is excellent for those of all ages who are motivated to maintain and increase their health while at the same time increasing your sense of gratitude and connection to your own inner peace and tranquility. No preregistration required, but participants must sign a waiver upon arrival. Bring a towel and water, as well as a mat for all yoga classes. Yoga mats can be purchased in the Discovery Green office 9am-6pm. Please consult your physician before engaging in exercise. Presented by Four Dragons Institute. 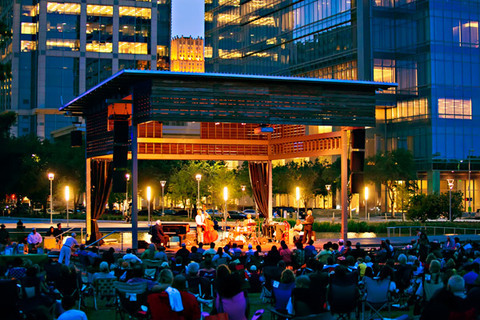 Discovery Green Conservancy is a 501(c)(3) non-profit organization that depends on the generosity of park visitors and other friends to maintain the park and to fund the more than 600+ free events held here every year. We welcome gifts of all sizes. There are a number of ways to get to Discovery Green – car, bike, bus, jitney service and more. Garage and street parking are conveniently located. Learn how to get here. Discover how your company can sponsor this event!